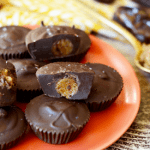 Healthy Salted Caramel Cups, it’s a real thing! 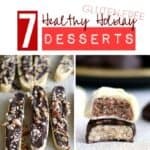 All you need are 4 simple ingredients to make this decadent dessert that’s paleo and vegan-friendly! Last week, Linley and I made our way to Costco to get ingredients for FFF’s b-day party. MAN, can you find some good deals at that place. Side note: we went to Costco at 1PM on a Thursday and I kid you not, there wasn’t a single parking space available. We had to walk about a mile. and a half. What the what. Everyone and their grandma (literally) was at that place. Our finds included lots of BALL ingredients in bulk (obviously): almond, honey, all-natural PB, dried cherries, and DATES. You can make your own homemade HEALTHY caramel with just 1 ingredient? It’s chewy, decadent and ready in less than 5! All you need are juicy dates and a food processor. There’s nothing worse than a dry medjool date. Are you with me? You guys seem to love all of FFF’s “cup” recipes. I’ve posted my fair share over the years: peanut butter, maple sesame cashew butter, almond butter sea salt. Well these will not disappoint you. Why? Because their center is a big blog of salted date caramel. Now that I’m single…maybe I’ll marry one of these. Seriously though these are HEAVEN. The best part is…you can eat like 14 of them and not feel bad for a second. First, prep date caramel by placing dates in a high-speed food processor. Process on high for about a 2 minutes, stopping to scrape the sides a few times. If you are having problems getting the dates to form a paste, add water by the 1/4 teaspoon. Using a 1/2 teaspoon, scoop out date caramel into your hand and roll into balls. You’ll want to make 24 and will most likely have some leftover date caramel. I like to wet my hands first so that it’s easier to roll into balls. Set aside. Next, melt chocolate. You can either do this by microwaving for about a minute to a minute and a half, or by melting over the stove. Once the chocolate has completely melted, add in coconut oil and stir. Place 24 cupcake liners on the bottom of a mini cupcake tin. Then, pour in the first layer of melted chocolate. I used a teaspoon of chocolate. Then, put a ball of date caramel on top and cover that with another teaspoon of melted chocolate. Sprinkle with Himalayan sea salt and then place in the freezer for at least 30 minutes before serving!